Visitors to the Chevrolet stand at this weekend’s Silverstone meeting of the Dunlop MSA British Touring Car Championship will get to witness three generations of iconic Camaro side-by-side – clearly showing how the latest incarnation of the legendary model bears the influences of its heritage. The new Camaro is powered by a 6.2-litre V8 engine developing 426bhp – a figure not significantly different from Stuart Scott’s 1970 car. But the oldest Camaro of the trio is not a standard road car – it’s a faithful replica of the former Richard Lloyd British Saloon Car Championship Camaro Z28 from the early Seventies, which won a number of races against smaller UK market cars. Powered by a tuned 5.7-litre V8, the race-bred engine produces 470bhp. Indeed, the Camaro is the only Chevrolet ever to win the title in Britain’s biggest ever tin-top series, in the hands of Australian Frank Gardner back in 1973. 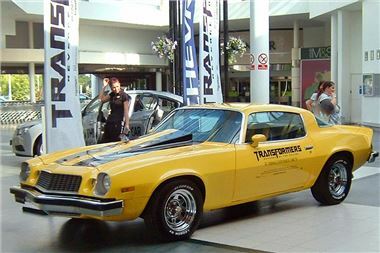 Joining the racer, which is next to be used in anger in the 2010 Tour Britannia next month, will be a 1976 Camaro created by Chevrolet to commemorate the launch of Transformers the Movie in 2007. With a slightly more sedate road-tuned 165bhp under the bonnet, albeit still with a 5.7-litre V8, the car echoes the look of ‘old’ Bumblebee in the movie – the car that morphed into the beefy new model as part of the movie’s storyline. The three cars will be the focal point of the Chevrolet stand at the race meeting, and will be home to a live Q and A session with Chevrolet BTCC drivers Jason Plato and Alex MacDowall, who will be answering questions from the public between races two and three.